Your Home Will be the Most Beautiful One on the Block. It’s all about the exterior of your property. Whether you’re planning on selling, or just want to update the worn outdated exterior – let our team of experts take care of the difficult part. We’ll help you make a house of your dreams a beautiful reality. It will not only please the eyes of your neighbours but also increase in value on the market and help you save heating and cooling. 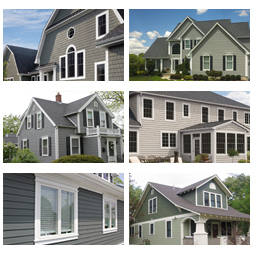 We offer over 200 colors of nationally advertised siding brands to choose from. You’ll be able to find a perfect one that matches the style of your home. At GP Home Improvements we provide a wide range of siding options, using basic to high-end materials. Whether you need new siding installed or want your home exterior updated, we’re up to the task. For over 10 years we’ve been working closely with each of our customers to understand their needs and help them on the path to a dream home.